I was educated and trained in China. My dream from my childhood is to become a scientist and to do research. During many years working experience in China, Japan, USA and Canada I accumulated extensive research skills in the fields of cell biology, animal research (transplantation, parabiosis surgery), protein biology, molecular biology and HIV study. I joined the Rossi lab at its foundation in 2001. As a senior research technician in Rossi lab, not only I am involved in most of the lab’s research projects, but I also had the opportunity to pioneer the method to sort myogenic and adipogenic progenitor cells from adult mouse. As a lab manager, I am in charge of organizing and maintaining the lab stocks, supplying necessary training to students and providing technical support. 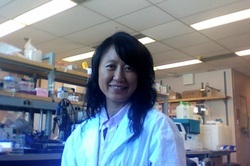 Outside the lab, Lin discovered her passion in sports (ski and swimming), cooking, crafting, coin collection and traveling.